Practice makes perfect. Mt. Hood. Cycling is a team sport, and I can continue to reiterate that point, over and over. Team. How can an individual’s effort support and bolster a team’s complete effort and goal? You can throw it all out there, including the kitchen sink for your teammates. You can believe in them, believe in yourself, and work as a cohesive unit. Bam. Who cares if you get dropped? You have support. You have back-up. You are more than an individual. I know I have been documenting my world travels, and I need to add another notch to the list. Hood River, Oregon. The Mt. Hood Cycling Classic. Adding to the stamps on my passport, I ventured up to Oregon (and even WASHINGTON) for this incredible 4 day, 5 stage, race. A prologue, 2 road races, a time trial, a criterium, all adding up to at least 20,000 feet of climbing. You want to know what a race in its purest forms feels like? It was all at the Mt. Hood CC. Incredible. As I packed up to go to this race, I was thinking of the team race, another chance for us to fine tune our machine for the races to come, such as NVGP and Nationals. I was thinking of training. Of climbing. Of “practicing” if you will. Practice makes perfect. Or so they say. 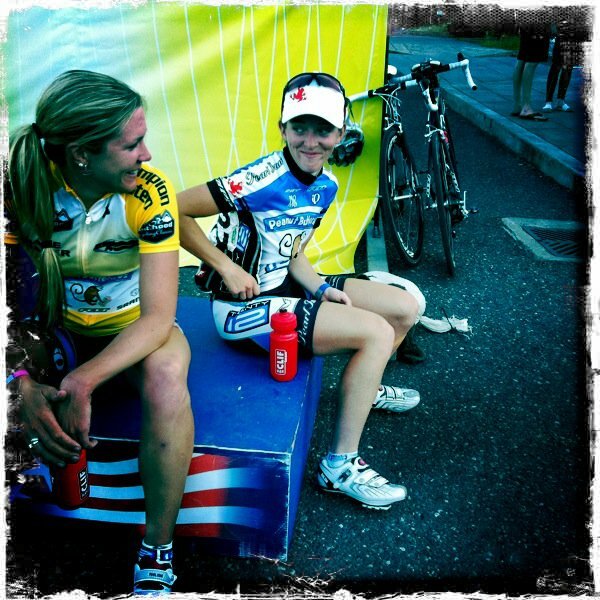 I finished 3rd in the prologue, to my teammate and mentor, Kristin Armstrong (who needs no introduction, she is that good) and Clara Hughes (Canadian Olympic medalist and cycling/speedskating superstar). We entered the first road race with some incredibly hard racing by all my teammates as we kept the pace high over all the climbs. After one of the most decisive 7mile climbs, the group had been whittled down to 6…then 3…then…Ouch. It was moments like that, you question your career. The suffering. The blurred vision. The seared lungs. Yes, I chose to come to Mt. Hood. It would be good “training”. Yes, this was my choice. One pedal in front of the other. Team tactics worked out flawlessly. KMac attacked. I countered. It sounds simple, but this counter took everything I had. When I attacked, I was already contemplating how I would manage to pedal these last 9k to the finish, not how I was going to win the race. I won. By 1:15. That put me into yellow. A yellow jersey? Wow. I say it was luck of the draw. KMac, or KStrong, or any of my teammates could have been in yellow. It was a team effort. When I was told to attack, I did. I thought I was going to get dropped. I thought I had nothing left. Yet, my team needed me to do a job, and I did it. It hurt. But I could dig deeper, put my head down a little lower, and ride harder into the finish, knowing if and when I got caught, there would be another winning move in our arsenal. I was unstoppable. 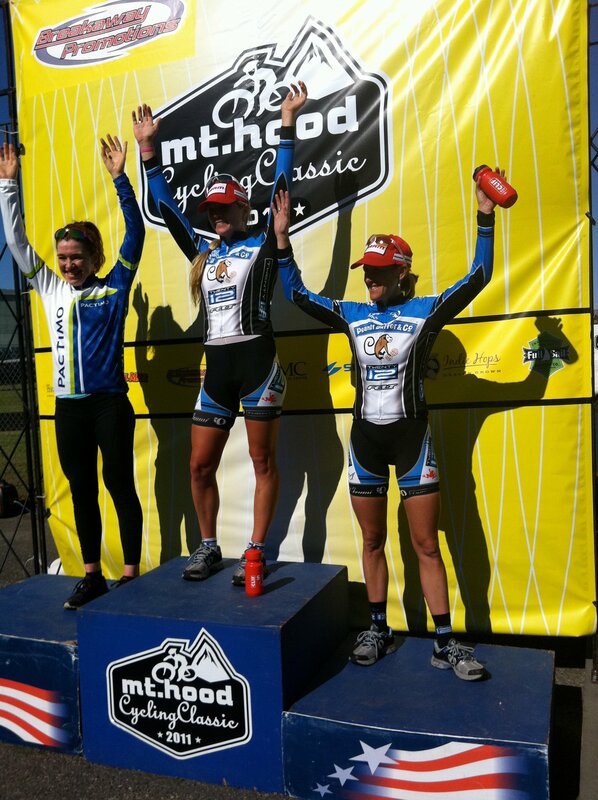 Another podium at the time trial, with Clara and Kristin. I might have put in a solid time trial effort the day before, but was still able to summon some strength for the TT. 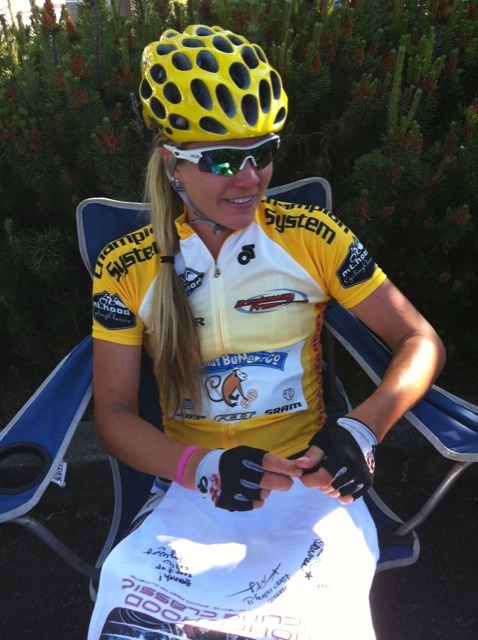 Followed by a criterium that night, where Kaitie, our Midwestern 19 yr old was able to win out of a break! The final day was the queen stage. 8200 ft of climbing. Alpine roads. No flat sections. You were either going up, or going down. And by up, I mean 14 miles of up. 12 miles of up. 10 miles of up. Up, up, up. Down, down. Up, up. You get the picture. 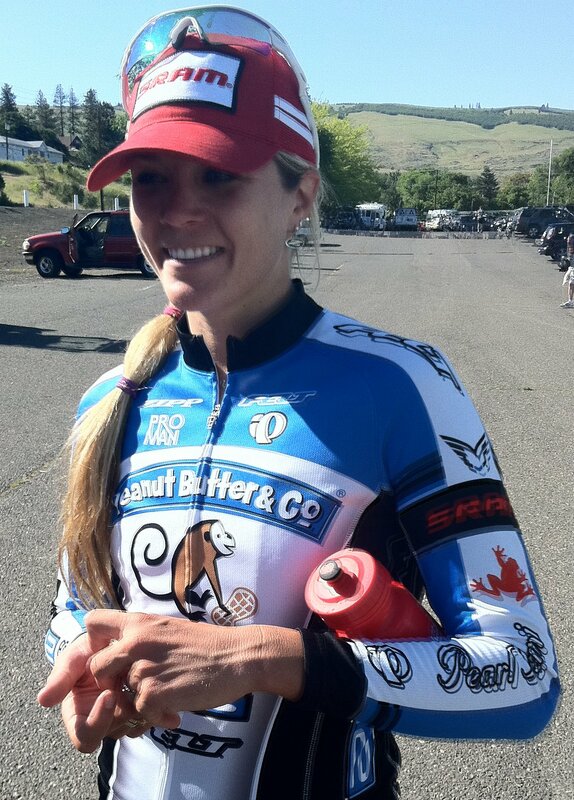 We once again worked as a team, securing the overall stage win and GC win for Kristin. Passing off my yellow jersey to her was an honor. I wore that jersey with pride. I recived the same satisfaction out of seeing it pass to her shoulders. Our team won. I won. A practice. Practice makes perfect. A training race. A yellow jersey. A yellow helmet. Did I mention I loved the helmet? I am honored to be a part of this program. I am excited for the rest of they year. I have a feeling more jerseys and helmets are in the future. Practice does make perfect, after all.